Many of the vegetables and seeds mentioned in this article are available at the ECHO Global Nursery and Bookstore. Within a couple days after Bonnie and I arrived in Florida in June 1981 to assume my new role as founding CEO of ECHO, I began digging a garden. For an avid gardener used to the long winters “up north” this was an exciting adventure. I was going to grow flowers and vegetables year-round in the Garden of Eden itself - at least something very close to it. Or so I thought. Today if you visit ECHO during the summer you will find food plants growing everywhere. But you will not find many of the “temperate” vegetables that are staples of most northern gardens. Many of them you will not even recognize. I am reminded of a letter received around 1990 from a family in Illinois that had accepted an assignment in a remote rainforest location in SE Asia “We are not going there to teach agriculture, but we are worried about where we will find vegetables for our family. We are told that you can’t grow vegetables in a rainforest.” My reply was that there is bad news and good news. Few, if any plants from your Illinois garden will grow there. However, the good news is that there are vegetables that grow in rainforests; you just need to grow plants that God placed there. And then some “sort of bad” news: you will need to “reset your taste buds” because they will probably not be familiar tastes. SW Florida’s hot, humid summers have a lot in common with rainforest conditions, minus the shade of tall trees and of course with less total rainfall and not quite as high humidity. So it is not surprising that some of the standard vegetables in ECHO’s summer gardens originated in tropical rainforests and hot, humid lowlands. Other important vegetables have originated in countries where there are perhaps six months without rain and six months that are like our summers. This document features some of our favorite vegetables. We often refer to them by the length of time they will grow before declining or dying. Some vegetables are grown every year from seed or cuttings (e.g. sweet potato). These are referred to as annual vegetables. But first let me tell you about a few great perennial vegetables. These are vegetables that will grow for several years after they are planted. Some of the perennial vegetables are the ones best adapted to SW Florida summers. They come from places such as western Central America where, much like Florida, there are very long dry seasons followed by hot, humid summers. They can easily survive both our dry springs and our wet summers. Some, but fewer, come from rainforests. During the coldest days of our winters perennial vegetables from any place in the tropics may be harmed or suspend growth for a few months. Take advantage of that time to grow the temperate vegetables that you enjoy. You have likely eaten two perennial vegetables from “up north”—rhubarb and asparagus. Asparagus cannot be grown here. Rhubarb can be grown here from seedlings started in the fall and transplanted, but dies after one harvest in late spring. Fortunately, there are many more perennial vegetables that do thrive in SW Florida. 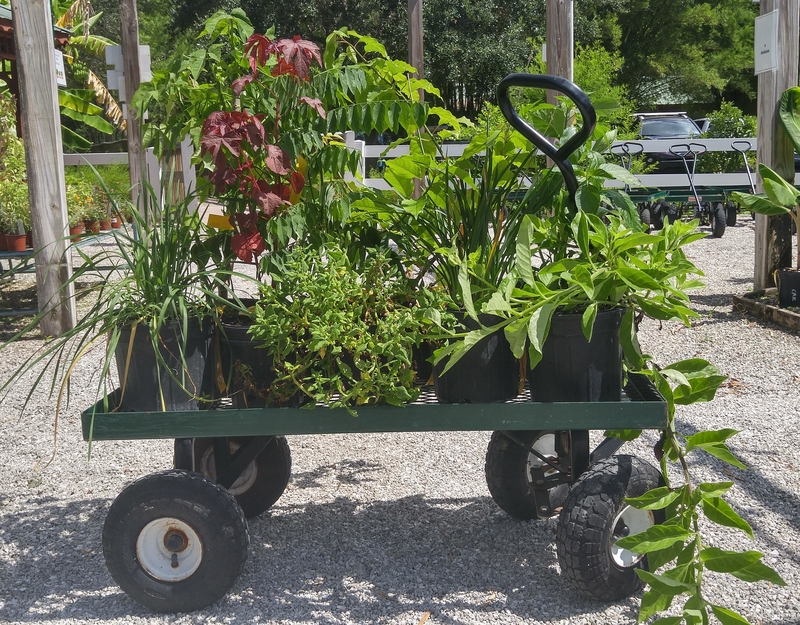 Many of the vegetables listed here have the potential to be perennials in SW Florida as long as the climatic conditions, solar intensity, changes in day length and pests do not kill them off. How far your garden is from the coast can make a big difference too. People can grow fruit trees on Pine Island (30 miles west of ECHO) that we can only grow with our expensive water spraying system that we can run on a freeze night. People that live another 30 or so miles farther east of ECHO cannot grow some perennials that will survive at ECHO. Perennial vegetables have a number of advantages to the home gardener. They don’t have to be planted each season. Perennials usually withstand harsh climates and weather better than annuals. They tend to be higher in nutrition than most vegetables. They often offer more than a single product for the table. For example, sweet potato provides us with delicious roots, but also offers a nutritious green vegetable. Unfortunately sweet potato beetles that eat from the roots begin causing serious harm after six months or so, thus limiting their potential to be a useful perennial. If you are growing vegetables for a food kitchen, homeless shelter or similar outreach for those who are hungry, keep the following in mind. Some of these subtropical or tropical vegetables may sound strange to you. You may find the taste unappealing if you were born and raised in this country. Remember that to people from more tropical countries, they might be preferred “comfort foods”! I have chosen vegetables for this document that I believe have a reasonably good chance of producing in the summer, but sometimes they still disappoint you. If you are willing and have the time to invest in the garden and watch carefully for the first signs of trouble and know what to do to handle those problems, you might be able to grow an expanded selection of vegetables or have better success with the ones you do grow. If you are comfortable using whatever toxic chemical is called for then the list might be even longer. Building some kind of structure that keeps rains from frequently making the leaves wet but letting the light in will also be helpful for some vegetables, e.g. tomatoes or strawberries. Vegetable amaranth is attractive (especially the variety ‘Tiger Leaf’) and produces leaves that taste much like spinach when cooked. Though it will grow well in the summer, stay alert to the likely arrival of small caterpillars that can devastate it within a few days. The natural insecticide called Bt® or Dipel® can be bought at your garden center and will control the insect if used in time. Vegetable amaranth or tampala is an annual and is propagated by seed. Basket vine grows as a large perennial, sprawling bush. It is considered a native species in South Florida and on many of the Caribbean islands. It has long pliable stems that are used in making baskets. The young leaves, eaten after cooking, are an outstanding green vegetable. They are reported to be extremely nutritious. Discard the cooking water. Some boil the leaves a second time in fresh water to remove traces of bitterness. (Note that the opposite of sour is bitter, so some vinegar or vinegar-based salad dressing might make it a better match for the taste buds of some.) There have been a few times where it has been killed to the ground in a freeze at ECHO, but will grow back. 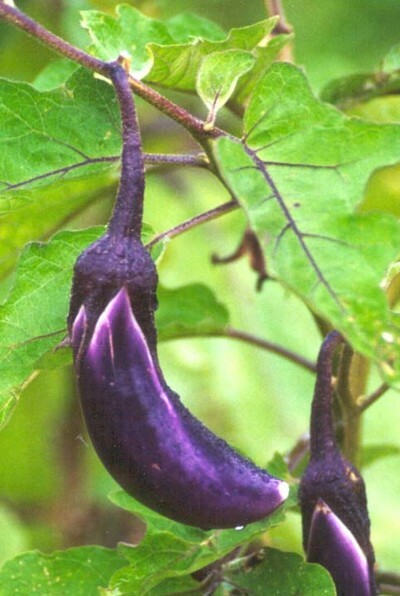 Although basket vine has a beautiful purple flower, it is propagated principally by cuttings. Both the leaves and roots contain a cyanide compound, so both should be cooked and the water drained. Leaves must be cooked at least 35 minutes to get rid of harmful cyanide compounds. Cassava should only be eaten in moderation. This reduces cyanide to a very low level. Check the web or ask a friend from the tropics for more details. Only eat cassava that is known to have more moderate amounts of cyanide. 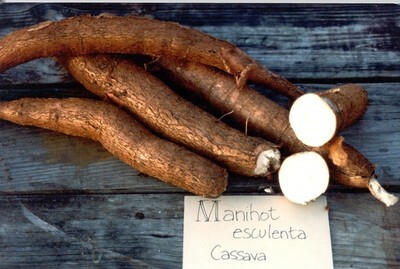 Cassava is frost sensitive but can re-sprout from the underground part of the stem if a freeze kills it to the ground. Keep in mind that your liver can detoxify modest amounts of cyanide and has almost certainly done that for you. Compounds that turn into cyanide when exposed to acid or chewed by an insect are one of the common ways nature has of helping plants survive. 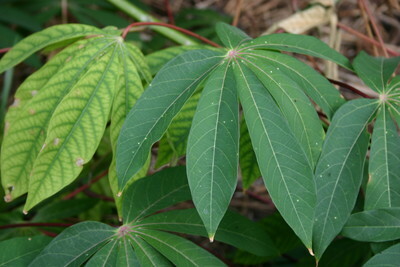 As with its cousin, cassava, the leaves of chaya must be cooked around 10 minutes or more in boiling water or cooked as a stir fry or baked in a casserole to remove the small amount of cyanide they contain. Do not use them fresh in salads The texture of the chaya leaf is firmer than many cooked greens. They remind me of collard greens. Most varieties of chaya have small stinging hairs that are harmless after cooking, but the variety ECHO sells is free of these hairs. A USDA study in Puerto Rico reported that one can get higher yields of greens per unit area with chaya than any other vegetable they have studied. Chaya is unique in that it is exceptionally resistant to the hot humid weather of a Florida summer and to extreme dry weather (that is the climate in Central America where the plant is native). Insects have not bothered chaya at ECHO. If the plant blows over in a tropical storm or the above-ground part is killed by a freeze, don’t worry. This often makes for a prettier, more unique plant, as the main stem sends up additional branches and a bushier plant results. Chaya plants almost never produce seeds, but propagate easily by cuttings. Edible hibiscus is a shrubby perennial from Indonesia, the leaves of which are flavorful eaten fresh as one would eat lettuce or cooked either alone or added to soups. It is grown exclusively for its leaves and is a very prolific producer, out yielding most crops planted for the production of leafy greens. It is touted as having very high nutritive value. Edible hibiscus must be propagated by cuttings, and is susceptible to nematodes. If you do not have nematode-free soil, try planting edible hibiscus in containers. The leaves can be as large as a slice of bread and one leaf can be used instead of lettuce. The plant is a hibiscus but only blooms, sparingly, in SW Florida around January. Ethiopian kale is an annual cole crop which originates in the East African Plateau. It tolerates high temperatures and high humidity, setting seed where other kale varieties will not. Young tender leaves and stem tips of Ethiopian kale may be eaten fresh in salads or cooked. Older leaves and stems may be cooked and eaten like collards. Flower stalks may be cooked and eaten like broccoli. It can also be used as a fodder crop species for animals. 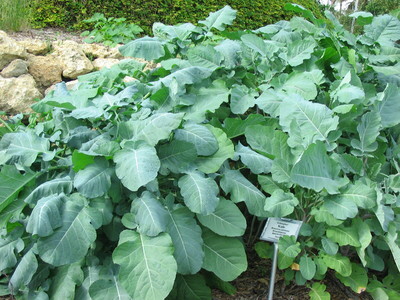 Ethiopian kale is reproduced by seed and it is easy to designate an area in the garden for constant production of this prolific, nutritious leafy vegetable. Cranberry hibiscus has striking red leaves and is similar to Japanese maple, in both leaf shape and color. 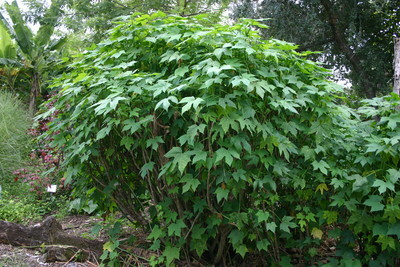 It can be planted in the spring and kept pruned for an attractive annual shrub and may be grown as a temporary hedge. Cranberry hibiscus is nematode and insect resistant and does well in sandy soil. The young tender red leaves have a tart flavor and are an attractive addition to fruit and tossed salads, slaws, or stir fries. In the fall it has pink blossoms. About thirty blossoms can be picked at dusk after they have folded, and blended with lime juice and sugar to make a beautiful and tasty drink. The petals add a bright red color rather than any special flavor. Pinch the tips of stems as it grows to make it bushy, otherwise it will grow several feet tall and fall over. Cranberry hibiscus may act as a long-term annual or as a short-term perennial and can be propagated by seed or by cuttings. Roselle, Hibiscus sabdariffa is sometimes called Florida cranberry because of the bright red, crunchy, sour calyx that can be used somewhat similarly to cranberries in recipes. The calyx surrounds the developing fruit and seed and is the size of a small nut. A very popular drink is made from the calyx in many tropical countries by cooking them in water, then adding sugar and lemon juice and cooling. Plant roselle later in the summer to avoid likely root knot nematode damage. It will not bloom and form the edible part until around October. Roselle, an annual is propagated by seed. Katuk is one of the staple vegetables in the rainforest climate of Borneo. It has become one of the favorite salad greens of the staff at ECHO, and is eaten either cooked or fresh for its nutritious leaves and shoots. The unique flavor of these leaves is most similar to raw peas when eaten raw. It grows exceptionally well in Florida, going dormant in the winter. 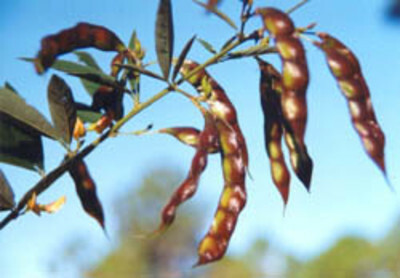 Katuk is disease and pest resistant, tolerates most soils, and grows in sun or shade. 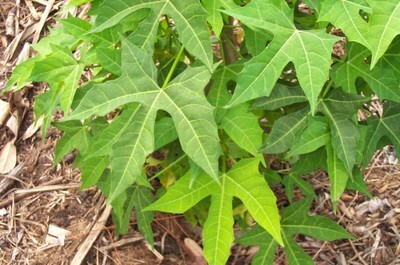 For the best tender shoots and leaves, grow katuk in at least half shade and fertilize frequently. This shrub should be occasionally pruned to 3-5 feet since it tends to grow straight up until it falls over. In SW Florida it can be killed back by hard freeze but grows back from the ground and may re-grow bushier than before. Ours have grown very successfully (28 years as of June 2016) under the north eaves of our house where it thrives on the reduced sunlight intensity and the concentrated rain runoff from the roof during the drier parts of the year. In Asia, katuk is propagated by seed as well as cuttings, but in SW Florida we have not been very successful with seed propagation. 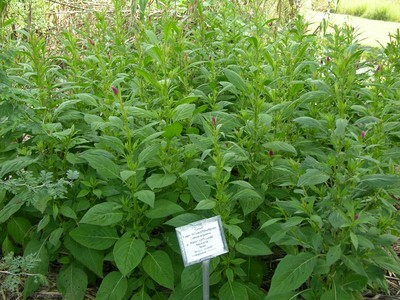 Lagos spinach is a cousin to vegetable amaranth but much less prone to insect damage. It is quite popular in SE Asia as well as West Africa where it originates (presumably named for Lagos, Nigeria). As a young plant before it flowers, it makes a tasty cooked green. Harvest it when it reaches 8-12 inches in height (before it flowers), cut up the whole plant except for the roots and put it into the pot. Boil it for at least a minute or two and discard the dark water. It is very much like cooked spinach in taste, color and texture. We found out the hard way not to steam cook it because boiling in water is needed to remove oxalates that otherwise leave a burning sensation on the tongue. It also has a beautiful flower later in the year; though at that stage the leaves become narrow and are not useful in cooking. Lagos spinach is an annual and is propagated by seed. There is a red- and a green-leafed variety. 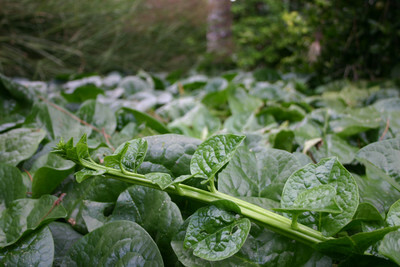 Malabar spinach is grown for its attractive edible leaves that are cooked. Some people like the mucilaginous (I didn’t want to say “slimy”) leaves and others do not. Though I do not care for mucilaginous vegetables, I am going to give this one another try. While teaching a workshop at an agricultural center in Alabama, the salad in their cafeteria one day was a large serving bowl solely of Malabar spinach leaves. I was very skeptical but after adding the various toppings and salad dressing, I did not notice the sliminess. It has potential to be a great substitute for lettuce in our hot summers. The plant can grow up a fence or trellis or sprawl along the ground and, on top of mulch, forms an attractive ground cover. 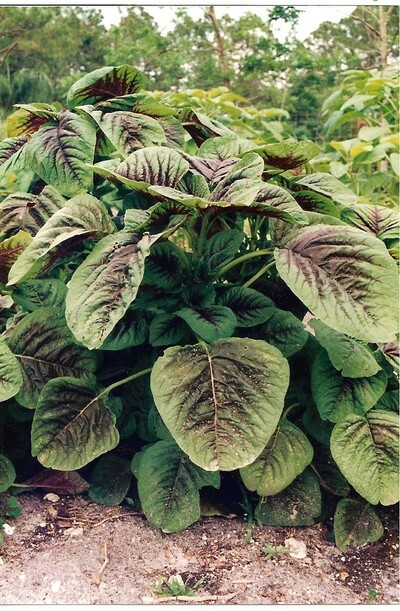 Malabar spinach is a perennial that comes in two stem colors. The variety ‘Bangladesh’ has red stems; the variety ‘Green Vines’ is entirely green. Both are propagated by seed and cuttings. 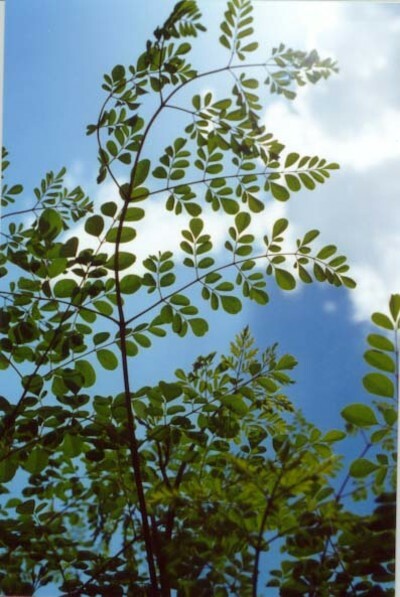 Moringa is a tree grown for food and seed at ECHO. It is one of the most requested seeds in ECHO’s seed bank. This is due to its many edible parts and its ability to survive in arid parts of the world. It is an exceptionally nutritious leafy vegetable. The large frilly leaves can be broken off easily at the stem and carried inside. The tiny leaflets can then be quickly pulled off between the fingers. Tender growing tips can be cooked stem and all. At ECHO, leaves are boiled as any green or added to soups or rice. In the southern portions of the United States the tree will probably survive a hard freeze but may be killed to the ground. Even where no freeze damage occurs, some people cut it back to about 4 feet each year. This causes the leaves to be closer to the ground for ease of harvesting. If not forced to branch by pruning, the tree becomes tall, spindly and in most cases not very attractive. We do not recommend it as a prominent shade tree or landscape specimen. Moringa might have potential as an annual vegetable farther north. We are told that as far north as Gainesville, Florida it is grown as a “cut and come again” perennial. We were sent a photo of a tree that was started in a greenhouse, transplanted out, and grew to the height of eight feet in Wisconsin before winter killed it. Aside from eating the leaves, very young pods can be cooked and eaten like asparagus or green beans. Pod production is variable and seems to be increased by stress. Some trees bloom at less than a year old and others take longer. Along with the moringa leaves and pods, the blossoms are also edible. All parts have a taste similar to mild horseradish. When trees are about 3 4 feet tall, they can be pulled out of the ground and the roots grated and used like horseradish. The root bark is toxic and should be peeled off before grating. Eat the roots in moderation only. Personally I just buy horseradish if that is the flavor I want and don’t risk the potentially harmful chemicals in the roots. Crushed raw leaves may irritate the skin and, if eaten in quantity, can be purgative. Under good conditions the tree can easily reach 15 feet the first year. The wood is very soft and does not make good fuel wood. Moringa may be propagated either by seed or cuttings. Trees from cuttings tend to be more susceptible to blowing over in the wind because the roots tend to be more shallow. New Zealand spinach is an annual green that often behaves more like a perennial. This is partially because the plant continues to grow and produce until the surrounding environment is no longer favorable for its growth and partially because it produces seeds close to the crown of the plant where they inconspicuously drop into the soil. They then lie dormant until conditions are ideal for them to germinate and continue growing the following season. Soak the seeds overnight before sowing. Plant in pots or direct seed into the garden, spaced at 1-2 feet apart. New Zealand spinach likes fertile soil, so the addition of organic matter in the form of compost, worm castings or animal manures will help maintain its lush vegetative growth. Harvest by snipping 3-4 inch tips of the stems or individual leaves. Picking them at least once a week ensures continued lush growth and leaf production. They may be prepared as you would spinach – either by cooking (steamed, boiled, stir-fried) or by eating fresh in salads, and may be substituted for spinach in any recipe. I have had limited experience with this vegetable as it always died out for me as summer progressed. Usually, if the area was not disturbed, new plants came up from seeds when the weather moderated. Okinawa spinach forms a dense, non-vining, edible ground cover, or as a specimen plant that grows well in full sun or partial shade. Grown commercially in China, the plant is a vigorous, perennial vegetable that is adaptable to a variety of tropical climates and requires little if any additional input. Okinawa spinach has attractive pointed leaves that are green on the top side and purple underneath. Young leaves and shoots can be eaten raw or cooked; at ECHO we use them as a colorful and nutritious addition to our salads. Its rather insignificant yellow blossoms attract a constant stream of butterflies. Okinawa spinach has potential to grow for more than one year but usually declines after about a year at ECHO. It is propagated by cuttings. Tropical lettuce grows well in full sun and tolerates the head of the South Florida summer, growing to perhaps four feet tall. When eaten fresh, the leaves are more bitter than I like, but some people enjoy bitter greens. I find them to have a nice flavor when stir-fried or boiled, but they are still not in my personal garden. Keep in mind when cooking greens or making salads that vinegar counters bitterness to some extent. Let me know if you find a way to use this that most people like. It is so productive I’d love to find a great way to prepare it. Tropical lettuce can be propagated by cuttings and by seed. As this “tropical lettuce” is perennial, it can be cut back and it will re-sprout. When you do this, remember to fertilize it to give it the needed boost. 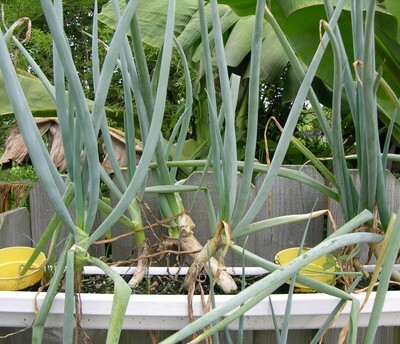 Bunching onions keep dividing, forming bunches that can be cut and used like green salad onions. These perennials may be propagated by divisions or by seed. Some in a container have survived several summers in my garden. Garlic chives make a great grass-like border or container plant, thriving through all seasons here in Florida. They are a great addition to an herb garden or as a border. Growing best in moist soils, they are also drought resistant. They grow well in sun or partial shade. The white stems and green leaves are used like green onions or chives to add flavor to salads, sour cream, stir fries, omelets and soups. Harvest by cutting off at ground level. Do not dig up the roots when you harvest! If you leave the roots they become very dense and the edible part will grow back in 3-4 weeks. 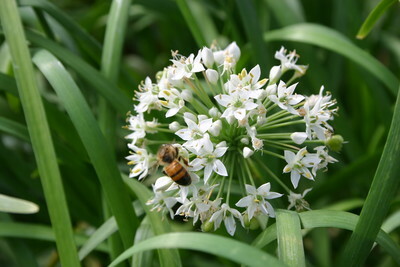 Garlic chives are perennial and are propagated by seed or division. Plants propagated by seed will themselves produce seed and may become weedy. If you want color, a plant with similar looking leaves called society garlic produces attractive purple flowers (and seeds). It also has a garlicy taste, but not nearly as subtle a taste as garlic chives. Hot peppers can be grown as annuals, but they are actually perennials, and in countries where it does not freeze they can grow for several years. The variety ‘Indian Firecracker’ is striking at the entrance to our home, growing in a child’s wading pool as a container garden. The small red and green peppers make the plant look like it is decorated for Christmas. The larger sweet peppers are annuals and usually do not do well in the summer. Okra and eggplant, well-known vegetables to most Americans, will grow well planted spring or summer in SW Florida. Both can be harmed by root knot nematodes. The pods of two okra varieties, ‘Borneo’ and ‘African’, can be eaten at a much larger size than most standard okra varieties. A Haitian agriculturalist at a mission I often visited in Haiti saw the potential of such long pods that were still edible, so he grew some himself and confidently took the harvest to the market. He could not sell them. People “knew” that these must be way too old to be good. These two varieties both out-produce most other okra varieties in the late summer planting at ECHO while other varieties do better in earlier plantings. Eggplants come in many colors, shapes and sizes, from large, melon-sized to those that are egg-sized to those that are pea-sized. Their cheerful color variations make an appetizing addition to a fresh vegetable platter, soups, stir-fries, casseroles and other dishes. Both okra and eggplant are propagated by seed. 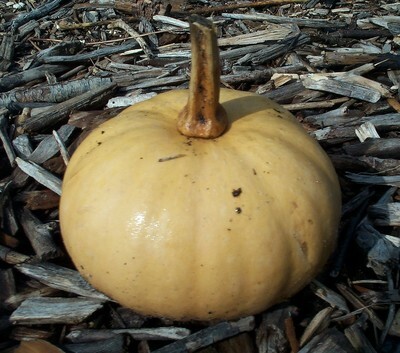 Tropical pumpkins are one of the same species of squash grown in temperate climates although these have been selected for production in the tropics. Latin markets will likely have ‘Calabaza,’ which is the same species. They are the only kind of pumpkin that I have seen successfully grown in Florida. It fact they can be very productive any time except during the coldest weather. Tropical pumpkins can be used the same as the temperate pumpkin, but it can also be baked just like a winter squash or cooked when it is small and green and used like a summer squash. Additionally, the flowers and young shoots may be cooked and eaten as greens or stir-fry. The pumpkin leaves can be damaged severely and quickly by a small caterpillar. See “vegetable amaranth” for a discussion of how to control it. The vigorous vines will grow along the ground and send out new roots, so planting near an area where it can sprawl is ideal. A few months later you might find the vine dead where you planted it but the new portion thriving many feet away. This may help the roots avoid nematodes. Wax gourd will grow best in the hot but dry late spring, but might produce into the summer months. It is sometimes called Chinese winter melon, and is popular in Asian markets and cuisine. The white flesh of the melon-like fruit is cooked in soups. The fruit is covered with an attractive white waxy “bloom” that protects it from microbial and insect attack and from drying out. Consequently, it stores exceptionally well. As with other plants in the cucurbit or cucumber family, the young shoots and flowers of the wax gourd may also be eaten in soups, in stir-fries or cooked and eaten as greens. Jicama is a bean plant, the seeds of which must not be eaten. It is grown for its edible underground tuber. The tubers begin to form when days are short around December and are harvested in January or February, though they need to be planted in the summer to take advantage of the rains and long days to develop the massive vines which pour energy into forming the tubers. Tubers will be the size of a grapefruit or larger if planted in May or June and the size of an apple if planted in August. My first experience with jicama was to plant seeds in February. Because the tubers could not form here until December or January, the vines had grown so vigorous that the tubers pushed up out of the ground, partially bursting open. They were roughly the size of a soccer ball. They were still edible, but not marketable. You will find jicama in most grocery stores. The shredded, raw, white crunchy item that you see on fancier salad bars is jicama. It remains crunchy when cooked in a stir fry or soup, so can be used as an inexpensive substitute for water chestnut. Jícama is an annual propagated by seed. 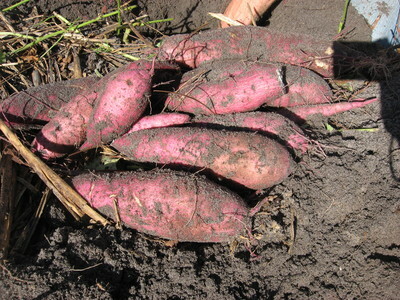 Sweet potato of most varieties will grow well in the summer and beyond in SW Florida. ECHO has several varieties. They need very warm growing conditions so should be planted during spring and summer and harvested four to five months after planting. Propagation is by cuttings stuck directly in the ground or by small fleshy root pieces. These can be planted almost any time of the year, provided there is sufficient soil moisture. Vine tips are high in protein; they may be cooked and eaten. The fleshy roots are a good energy food, and the roots with orange-colored flesh indicate high quantities of vitamin A.
Colocasia esculenta & Xanthosoma spp. Taro and Tanier are two types of root crops that will grow well in the summer. Taro and dasheen are grown principally for their large, edible starchy corms (underground root and stem structure). Taro is grown in wet, paddy-like surroundings, is fibrous and has a spongy texture. It is usually beaten to extract the starch which is made into poi. 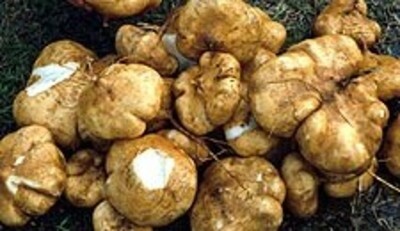 Dasheen is grown in a drier, upland environment and the corms are crisp, easily cut and are eaten as a boiled or fried vegetable. Colocasia has peltate (petiole attached to the leaf inside the leaf margins) shaped leaves to distinguish it from the Xanthosoma leaves which are sagittate (arrow head) shaped. Xanthosoma species are also grown principally for their starchy corms, but many also have leaves that when cooked make excellent greens. It is recommended to use the leaves that are freshly unrolling, although different species and different cultures will treat this differently. Often the petioles are peeled and cut into sections revealing their spongy insides for use in soups. These crops have varying quantities of oxalates and oxalic acid, and so it is recommended to boil them and discard the water to remove the acrid taste that may cause the sensation of pins and needles on your tongue. You can find the corms of these crops in the grocery store and this will be your best source of propagation stock. They can be cut and allowed to heal over or dry before planting them. Make sure each piece has at least 1 bud or eye to sprout. Yam is often confused with sweet potato, which is sometimes called ‘yam’ in the United States. Those who know the tropical yam, however, will not mistake it with sweet potato. Yam is a tuber crop that is well known throughout the humid tropics of Tropical America, the Caribbean, Africa, and Asia. In Florida you will see it sold in the supermarkets under the Spanish name, ‘ñame’ (pronounced: nyah-may). The yam is an important carbohydrate food that is relatively easy to grow. Yams have a very specific life cycle. Unlike the sweet potato, which can be planted by vine cuttings almost year-round, the yam is planted once-a-year, when the stored tuber begins sprouting. At ECHO, this usually begins in February or March. As the tuber breaks dormancy, the energy is transferred from the tuber into stem and leaf growth. This vegetative stage, lasting 6 to 8 months, occurs during the warm and humid summer months. A new root system with multiple tubers develops with most of the tuber development occurring toward the end of the rainy season and into fall. When the vine dies back, the tubers are ready for harvest. At ECHO this usually occurs in late November. Yams do well in sun or partial shade and prosper with ample rainfall. They require good drainage, and therefore, are often planted on mounds or ridges. They are most commonly staked but can be planted on a trellis or at the base of a sufficiently strong tree. At ECHO it has worked well to stake them with bamboo, not more than 1 inch in diameter as the vines have some difficulty twining up the large bamboo’s slick exterior. Growth is lush and very vigorous once the rains begin. Remember the vines die back in the fall. They then get a number of leaf diseases and look sickly; however, this has little effect on the tuber. When harvesting, be careful as the tuber skin is thin and easily damaged. The tubers are often large, several lbs. a piece, often as great as 15 lbs. or more. The yam is consumed much like a potato - peeled, then boiled or baked. Peel or cut away any discolored areas. Yams reportedly make good French fries and chips. The storage life of the yam tuber is short, averaging maybe 2 to 3 months, due to the high moisture content. One recommendation is to harvest them as needed when they are in the dormant stage. If unused, the tuber will begin to sprout in the spring. For propagating, yam sprouts first at the top, which is the most desirable planting piece next to a whole ‘seed’ tuber. Cut off a section about the size of an adult’s fist and cure it a few days in the shade before planting. 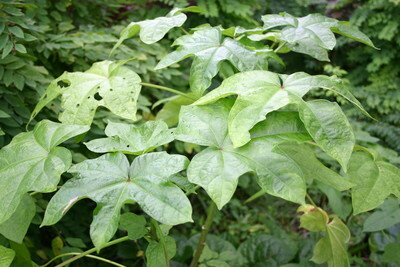 Yam is a wonderful food and is generally an easy, dependable crop to grow. Note: Planting should be done in February or March to allow for the greatest amount of sunlight and heat units for growth and tuber development. Yam is then harvested in November to January. You may purchase yams in the supermarket (generally found under the Spanish name, ‘ñame’) and these may be sprouted and planted in your garden. Word of Caution: A wild form of Dioscorea alata called winged yam is a noxious, class I invasive weed species in Southern Florida. It is not the same as D. bulbifera the “air potato,” also a class I invasive, but care must be taken when planting this crop. Water chestnut is a popular ingredient of Chinese cooking that can be easily grown in an inexpensive plastic wading pool. The best planting time in south Florida is March through June. Start plants by placing corms in a large styrofoam coffee cup with soil and some standing water. After a good root mass has developed, place 6-10 plants on the bottom of the pool, stuff pine needles tightly around them and periodically add some fertilizer. Keep flooded with water. When the tops die down in November, you should find dozens of “chestnuts” on the bottom. You can also just grow in regular soil, but then the corms will be more difficult to harvest because they will likely be spread throughout the soil. Corms can be stored in moist mud or refrigerated at 50 to 55º F. They should not be allowed to dry out. You can find chestnut corms in fresh markets where Asian vegetables are sold. In southern Florida during the summer months Phaseolus (green beans or common beans) do not grow well due to the heat, moisture and diseases. However, the Vigna beans usually thrive. Here we feature two types, with a third in the following entry, all of which will do well in the summer Florida garden. There are similarities, but differences in their uses as well. Southern pea and adzuki have the same bushy growth habits, although the adzuki bean itself is a bit smaller than the pea. Whereas southern pea is prepared more as a shell pea, the adzuki is prepared more as a dried bean or pulse. At ECHO we have also noticed that adzuki bean is consistently more insect tolerant than the southern peas. Pigeon pea can be grown as an annual maturing over several months or as a perennial. Usually it thrives for only one season at ECHO. 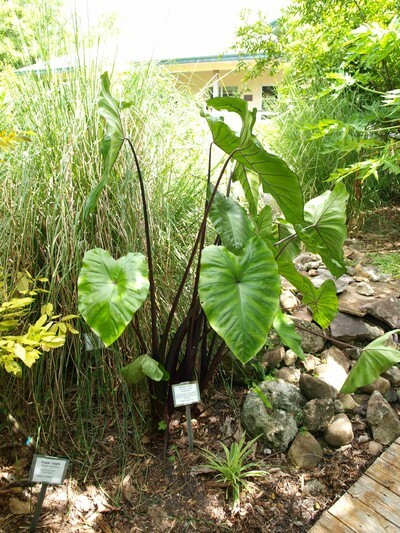 It is very popular in parts of the tropical world as it thrives in both humid and in arid regions. The attractive plant grows to three to eight feet, depending upon the variety, and is used as a dry bean and as a fuel wood plant. Pigeon pea is propagated by seed, and although you can purchase them from seed suppliers, you will probably get good results and a good commercial variety by purchasing them (‘gandul’ in Spanish, ‘pwa kongo’ in Haitian Creole) in the ethnic foods section at your supermarket. Cook the dried “peas” As you would other dried peas and beans. Look for recipes on the web. Winged beans are grown principally for their edible winged pods. Pick them when you can bend the pod without breaking it or it will become too tough to eat. The leaves and flowers are also edible and quite appealing. The plants thrive in the hot humid summers of southern Florida with few disease or insect problems, though nematodes can be a problem. Most varieties of this jungle plant from Borneo only bloom and set fruit when the days become very short, so they are planted in early fall. The variety ‘Chimbu’ produces longer pods than most and is a striking deep red color. For pods in a summer garden in Florida or “up north,” be sure to purchase a day neutral or long day variety. 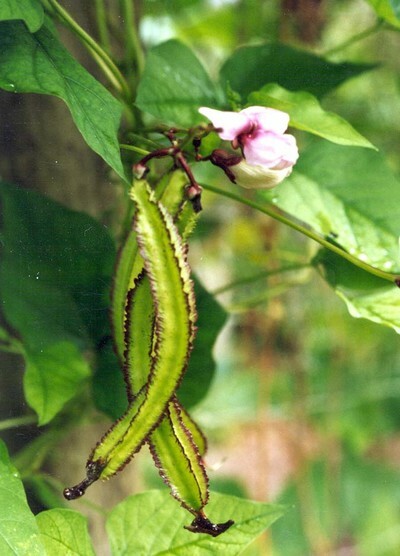 Yard-long bean produces pods similar to climbing green beans of temperate regions except that they really can be up to a yard long. I find two feet to be more common. They require a trellis, though I grew them successfully in northern Indiana when I was working at Purdue University before coming to ECHO. The yard-long bean is eaten as one would eat fresh or green “string” beans, either cooked or uncooked. When Bonnie wanted green beans from the garden for the two of us, I would pick three pods. There is a purple “yard long” bean that is visually quite striking in the garden. I actually prefer its taste to the longer ones, though it only grows to perhaps a foot in length. 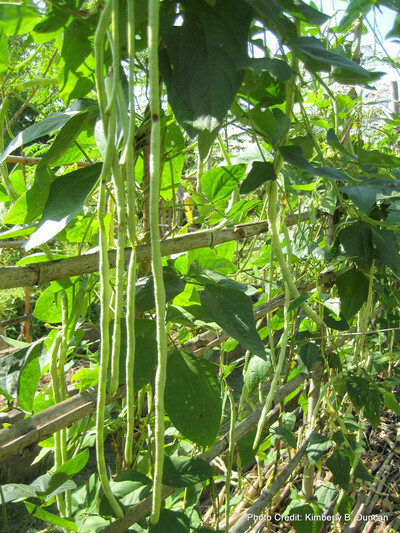 The yard-long bean is an annual propagated by seed. Dahlgren, K. 1982. Growing Vegetables in Fiji. Suva, Fiji: Peace Corps Fiji. Martin, F. W., and R.M. Ruberté. 1975. Edible Leaves of the Tropics. Agency for International Development, Dept. of State, in cooperation with Agricultural Research Service, U.S. Dept. of Agriculture. Martin, F. and ECHO Staff. 2015. ECHO Technical Note #81: Introduction to Tropical Root Crops.